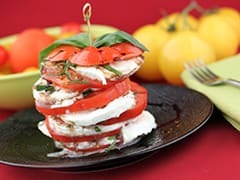 Before starting this Tomato & Mozzarella Stack recipe, make sure you have organised all the necessary ingredients. On a chopping board, slice the tomato crosswise. With a sharp knife, cut the mozzarella into thin slices (2 or 3mm). Take the basil leaves and roll them all together. Rub the bottom slice of the tomato with fresh basil and arrange it at the bottom of the plate. Season with salt.